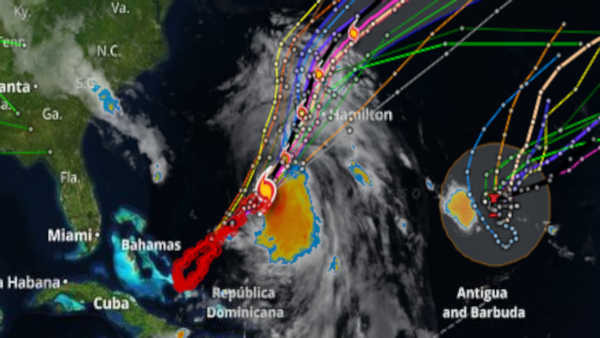 A weakening Hurricane Joaquin moved past Bermuda and farther out into the Atlantic after pounding the wealthy financial haven and tourist destination with heavy rains and winds. All flights to the island's L.F. Wade International Airport were cancelled on Sunday and ferry service was closed due to rough seas. Emergency service agencies were placed on alert and there were scattered power outages by early evening. "I think it's going to be bad, and last year I lost a lot of stuff to the storms," said retiree Susan DeSilva, whose son-in-law helped her secure her windows and doors as the storm approached. Others were far less worried in the tiny territory accustomed to rough weather. At least one bar in the capital of Hamilton was packed with people riding out the hurricane with drinks and friends. "I can think of worse places to be," said Derrick Tucker in the crowded Robin Hood Pub and Restaurant as the wind whistled outside. After roaring across parts of the Bahamas as a major Category 4 hurricane, Joaquin lost steam as it headed north. By late Sunday night, U.S. forecasters said sustained winds had dropped to 85 mph (140 kph). Still, it was expected to bring hurricane conditions and life-threatening storm surge to Bermuda Sunday night when the storm's eye passes closest to the island. Hundreds were rescued from fast-moving floodwaters Sunday in the U.S. state of South Carolina as days of driving rain hit a dangerous crescendo that buckled buildings and roads, closed a major East Coast interstate route and threatened the drinking water supply for the capital city. The powerful rainstorm dumped more than a foot (30 cms) of rain overnight on Columbia, swamping hundreds of businesses and homes. Emergency workers waded into waist-deep water to help people trapped in cars, dozens of boats fanned out to rescue others in flooded neighborhoods and some were plucked from rooftops by helicopters. More door-to-door search operations are planned Monday. As the hurricane's eye moves past Bermuda, swells kicked up by the storm will continue to affect the Bahamas and the eastern coast of the U.S. about 600 miles (965 kilometers) away. The U.S. National Hurricane Center in Miami said that elevated water levels and big waves from Joaquin will affect the U.S. mid-Atlantic region, "causing significant beach and dune erosion with moderate coastal flooding likely." Joaquin lashed the lightly populated southeastern Bahamas earlier in the week, damaging hundreds of homes and causing severe flooding on several small islands in the sprawling archipelago off Florida's east coast. The government said it was still working to calculate the extent of the damage to infrastructure and private property. Aircraft and ships searched the southeastern Bahamas for a U.S. cargo ship with 33 people on board. The craft lost power and communications when it was caught in the strengthening hurricane and has not been heard from since Thursday. Joaquin's center was located some 70 miles (110 kilometers) northwest of Bermuda, with hurricane-force winds extending outward up to 45 miles (75 kilometers). It is tracking north-northeast at 13 mph (20 kph). Track Hurricane Joaquin wherever you go. Download the AccuTrack Weather Alert app for your iPhone or Android device. Search abc7NY in the App Store or Google Play, or visit abc7NY.com/apps.